A bit over six months in, the real-estate industry has benefited more than any other industry from a historic law change that fundamentally altered the way companies are allowed to raise money. The real-estate industry has raised almost $17.5 million from investors since the Securities and Exchange Commission lifted its decades-long ban on general solicitation in September, according to Crowdnetic, a New York City firm that has been gathering data on this new crowdfinance industry. 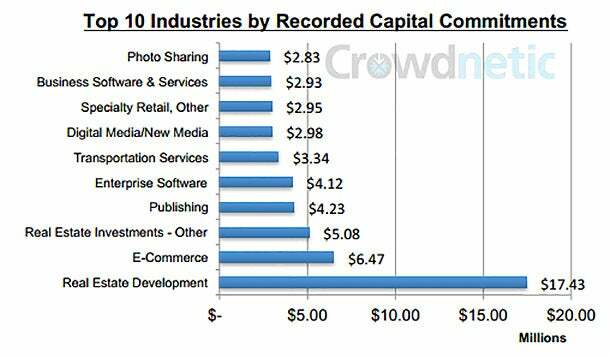 The next most funded industry was ecommerce, which raised $6.5 million -- just over a third of what the real-estate industry has raised. The rule change, which was enacted as part of the Jumpstart Our Business Startups Act (or JOBS Act), made it legal for entrepreneurs to publicly advertise their efforts to raise money. Those companies taking advantage of the change are dubbed “private issuers publicly raising.” Crowdnetic has data on almost 3,600 of these companies. Of them, a bit more than 2,800 are actively seeking funding right now. Across the board, entrepreneurs are benefitting from the new regulation. In just the last three months, private issuers publicly raising have increased their investment dollars 68 percent. In addition, the number of companies looking to raise money jumped by 25 percent, according to Crowdnetic’s latest report, released today. One explanation offered for the breakout success of the real-estate industry is that investors are comforted by having a tangible object to serve as collateral should a business venture end up bankrupt. Also, says Cox in an email with Entrepreneur.com, investments in real estate developments is comparatively profitable and doesn’t demand exceptionally huge amounts of capital to invest. “Real estate backed crowd financed investments, especially in distressed properties, appear to be appealing to investors given returns can range from 6 percent to 8 percent in some funds, the relatively low investment minimums (averaging $25,000), and risk mitigation (because of the hard asset securitization),” she says. Related: Looking For Capital? Don't Forget About the Little Bank That Could.